Intel's RealSense computer vision platform has been lacking a low-powered way of recognizing what its depth-sensing cameras are seeing -- until now. The chip giant is buying Movidius, the designer of a range of system-on-chip products for accelerating computer vision processing. Movidius supplies chips to drone makers such as DJI and to thermal imaging company FLIR Systems, itself a supplier of DJI. Its chips help computers figure out what they are seeing through cameras like Intel's RealSense by breaking down the processing into a set of smaller tasks that they can execute in parallel. There are systems that already do this using GPUs, but those are relatively power-hungry, often consuming tens of watts. That's not a problem in fixed applications with access to mains electricity, or in cars, which have huge batteries and a way to recharge them. But in drones or other lightweight IoT devices, power consumption needs to be much lower. Movidius aims for a design power of around one watt with its Myriad 2 vision processing units. Josh Walden, senior vice president and general manager of Intel's New Technology Group, sees potential for Movidius to help it create systems for drones, and also for augmented, virtual and merged reality devices, robots and security cameras, he said in a post to the company's blog. 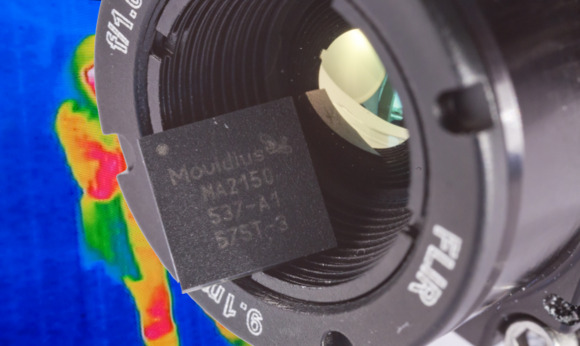 It's not just about the chips, he said: Intel is also buying algorithms developed by Movidius for deep learning, depth processing, navigation and mapping, and natural interactions.